How can I obtain Health Insurance during the Special Enrollment Period in 2016? 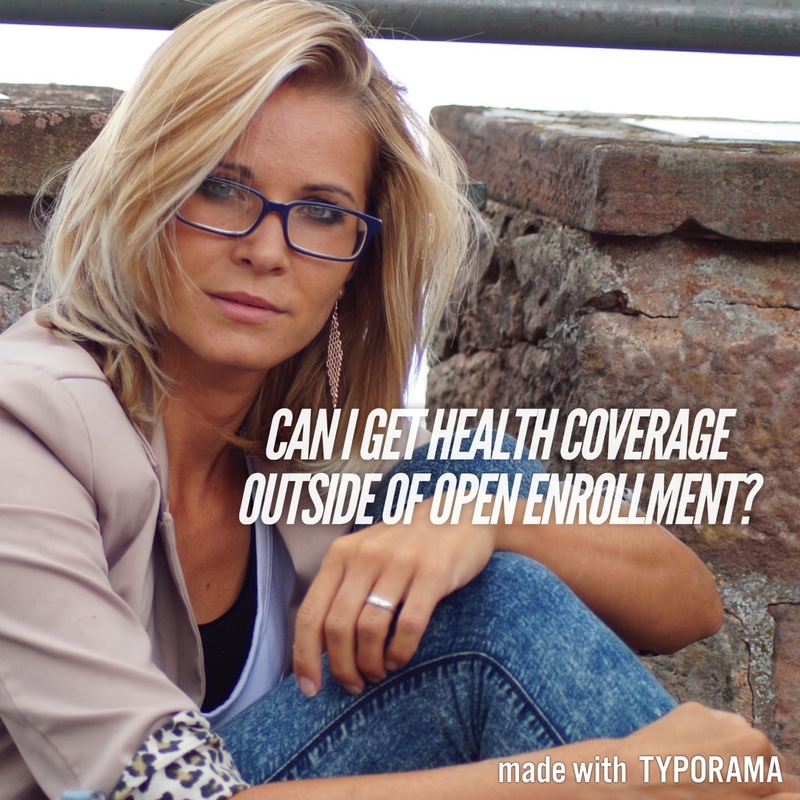 The 2016 Open Enrollment period for obtaining health insurance ended January 31, 2016. We are now in the Special Enrollment Period,wherein no changes can be made to your health insurance contract until the next Open Enrollment Period begins, which will be from November 1st, 2016 through January 31st, 2017 . The Special Enrollment Period runs from February 1, 2016 to October 31, 2016, and in this time period only Californians, who experience a qualifying event may enroll in a new health insurance plan or make changes to an existing one. A consumer has 60 days from the date of the qualifying event, including the date of the qualifying event, to apply for coverage or make a change to an existing plan. The 15th of the month is the cutoff date for a 1st of the following month effective date. 1. An Individual and any dependents lost minimum essential health coverage (except if terminated for non-payment of premium). 3. An individual experienced an error in enrollment by the insurance carrier. 5. An individual became newly eligible or ineligible for advance payments of the premium tax credit, or is experiencing a change in eligibility for cost-sharing reductions. 6. An individual or enrollee made a permanent move to a new service area and new coverage is available. 9. An individual who recently is released from incarceration. So even if the Open Enrollment Period has passed there still are ways for Californians to enroll in the Affordable Health Care plans of 2016. Do remember that you have only 60 days to enroll from the date of the qualifying event. In the Special Enrollment Period you will fill out the regular insurance application of the health insurance carrier , along with a proof of your qualifying event. For example, provide for a newborn a birth certificate, for marriage your marriage license, for gaining citizenship your Naturalization paperwork, for loss of employment your termination letter, which indicates your loss of health care coverage along with loss of work, for a move into a service area your lease agreement or mortgage. It is crucial that you remember to pay your health insurance premiums by the due date! The grace period for late payments is only 30 days, after which termination of your coverage will occur, and you will have no ability to obtain health insurance, which meets the Affordable Care Act requirements for 2016, until the next Open Enrollment Period, 11/1/2016. Not only will you not be able to obtain health insurance, but you will be responsible for paying a tax penalty for the months you have not signed up for health insurance. The tax penalty in 2016 will be 2.5 % of your household income or $ 695 per Individual, whatever amount is higher. Non-Payment is one of the biggest causes of loss of health insurance under the Affordable Care Act. It is the responsibility of the policy holders to make sure that the payment is actually placed with the insurance carrier. My suggestion is to treat your payment of your health insurance premium in the same manner you pay your mortgage or car loan. All major health insurance carriers offer member portals, where you will be able to view your payment history, claims history, your member benefits, list of doctors, health tips and information and often a link to a 24/7 nurse line. Check out monthly that you show “paid” on your member portal, and even that your bank or credit card statement reflects the charge. There is a misconception by Californians who bought health insurance on the exchange, that they could obtain health insurance off the exchange if they missed a payment. This is not the fact. Especially for people with critical illnesses, it is important that you have set up your monthly payment, and delegate a family member or friend to make sure that payments are placed when you are in the hospital. Californians who do not qualify for a life event during the Special Enrollment Period can still apply for short term health insurance. Most short term health insurance do not meet the standards of the Affordable Care Act; they offer basic emergency care, require medical underwriting and offer policy limits. Often short term health insurance plans do not offer prescription coverage;only hospital and emergency care. The premiums for Short Term Health Insurance are very competitive. Knowing that you are covered for emergency and hospital stay will at least ease your mind until the next Open Enrollment Period starts November 1, 2016. Even if you sign up for A Short Term Health insurance you will have to pay the tax penalty for the months you did not have an ACA compliant health care plan. Our mission at Solid Health Insurance Services is to find Californians affordable health insurance which fits your health and budget needs with the doctor of your choice. Let us help you to navigate your health care needs during the Special Enrollment Period of 2016 .